Our range of products include Mini MP3 Player Module, Logic Level Converter, Digital Thermometers Electronic Thermometers, MP3 Player Audio Decoder Module, ISD1820 Voice Module and Passive Buzzer Module. 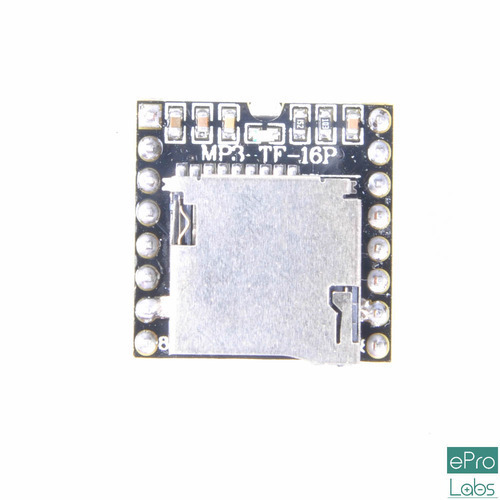 The Mini MP3 Module is a small and low cost MP3 module with an simplified output directly to the speaker. The module can be used as a stand alone module with attached battery, speaker and push buttons or used in combination with an Arduino or any other microcontroller with RX/TX capabilities. It is perfectly integrates hard decoding module, which supports common audio formats such as MP3, WAV and WMA. Besides, it also supports TF card with FAT16, FAT32 file system. Through a simple serial port, you can play the designated music without any other tedious underlying operations. The Logic Level Converter Module provides a bidirectional interface between devices operating at different voltages. The typical application is use of 3.3V sensors or devices with a 5V microcontroller such as an Arduino. Up to 4 digital I/O lines can be converted.The board needs to be powered from the two voltages sources (high voltage and low voltage) that the system is using.High voltage (5V for example) to the ‘HV’ pin, low voltage (3.3V for example) to ‘LV’, and ground from the system to the ‘GND’ pin. Measuring real time temperature was never this easy. Just put in the two small low cost button cells and the module starts showing the ambient temperature immediately. The module includes a RTD based temperature sensor probe and all the electronics and display the ambient temperature immediately. Our versatile MP3 player module is a full featured MP3 player with multiple options of play back and source. The module can read MP3 files from either a USB pen drive or a micro SD card. The module can take upto 32GB pen drives and 16GB SD cards. The module has a on board 3W mono audio amplifier for connecting a speaker. Alternatively a stereo head phone jack is provided. The module is controller by 4 switches and can take any 3.7V to 5V power source including USB power. This module board is based on ISD18B20, which is a single-chip single-message record/playback device. Recordings are stored into on-chip non-volatile memory, providing zero-power message storage. With the embedded Flash memory employed, data retention up to 100 years and typical 100,000 erase/record cycles can be reached. Time for recording is 8-20 seconds. A buzzer or beeper is an audio signaling device, which may be mechanical, electromechanical, or piezoelectric. Typical uses of buzzers and beepers include alarm devices, timers and confirmation of user input such as a mouse click or keystroke. RGB tricolor access the current limiting resistor to prevent burn out.The PWM modulator with three primary colors can be mixed in different colors with a variety of microcontroller interface.RGB LEDs are Tri-color LEDs with red, green, and blue emitters, in general using a four-wire connection with one common lead (anode or cathode). These LEDs can have either common positive or common negative leads. Others however, have only two leads (positive and negative) and have a built in tiny electronic control unit. OV7670 image sensor, small volume, low operating voltage, providing all functions of a single chip of VGA camera and image processor. Through SCCB bus control, the sensor can output the whole frame, sampling, and various resolution 8 bits of data. The product VGA image can reach up to a maximum of 30 frames per second. Users can completely control the image quality, data format and transmission mode.All the process of image processing functions can be through the SCCB programming interface, including gamma curve, white balance, saturation and chroma.OmmiVision image sensor has been in application of unique sensor technology, by reducing or eliminating the optical or electronic defect such as fixed pattern noise, tail, floating away, etc., to improve the quality of the image, and get the clear and stable color images. SD Card module can make your SD application more easier and simple.It Can be used for SD Card more easily, such as for MP3 Player, MCU/ARM system control. W5100 is a versatile single-chip network interface chip, internal integration 10/100 Ethernet controller, mainly used in high integration, high stability, high performance and low cost of embedded systems.Using W5100 can realize no Internet connection of the operating system.W5100 with IEEE802.3 10 base-t and 802.3 u 100 base – TX compatible.W5100 internal integration of the whole hardware, and after many years of market validation of TCP/IP protocol stack, Ethernet medium transport layer (MAC) and physical layer (PHY).Using W5100 don’t need to consider the control of Ethernet, only need for a simple port (Socket) programming.